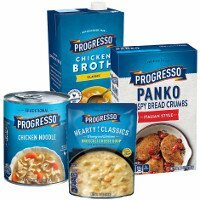 At Progresso, we have a passion for making great soup. We humbly believe that real, quality food can come in a can. That’s why we are on a never-ending journey to serve people the very best soup. Soup-worthy of a spot (or two, or four) in the cupboard. Soup that people genuinely get excited to eat. Soup that is as wholesome as it is delicious. Progresso has the best traditional soups. I use only Progresso Italian tomatoes for spaghetti sauce. They are the best. Best soup that tastes closest to homemade. Great coupon to have! Thanks!